Elderly adults are more likely to be injured in a slip and fall accident than any other age group. They often struggle with physical conditions that increase the risk of a slip and fall accident, like dizziness, vertigo, poor balance, and poor vision. Family caregivers and elder care providers who are helping aging adults that can’t take care of themselves have a responsibility to do everything they can to prevent a dangerous slip and fall accident. Since many elderly adults lose the ability to take care of themselves and perform daily tasks around the house, they depend on family caregivers and elder care providers to do things on their behalf, like meal preparation, housekeeping, pet care, dressing, grooming, and laundry. Family caregivers and elder care providers are also the ones that drive the senior to appointments and errands. 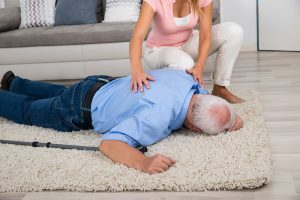 It makes sense that the elderly adult’s support group also takes a closer look at all the hidden hazards that contribute to slip and fall accidents and take steps to prevent them from happening. 1. Get them a full medical checkup. Many elderly people experience falls because of medical issues they are dealing with, as well as slower reflexes and weakened muscles. Health issues could include dizziness, vertigo, high blood pressure, arthritis, stroke, dehydration, and even instability due to the side effects of certain medications they take. A doctor can help with a treatment plan to minimize any medical issues that may contribute to falling. 2. Clean and clear walking paths. Family caregivers and elder care providers must keep all the pathways in the house clear from clutter and uneven surfaces. This also includes loose throw rugs, protruding furniture, and thresholds. Tripping is a big factor in slip and falls, especially when the elderly person is in loose shoes like slippers. 3. Proper training with walking aides. It seems like using a cane or walker is easy to do, but there are right and wrong ways to use them. Family caregivers and elder care providers should observe the senior to make sure the walking aide isn’t causing problems instead of helping. It doesn’t hurt to have a physical therapist or doctor go over the proper cane or walker techniques with the elderly adult. 4. Install supports and hand rails. Many elderly adults lose their balance in certain hazardous areas of the house, specifically the bathroom, kitchen, and on stairs. Installing support rails at key locations can provide them with the stability they need when they are most unsteady. 5. Stay healthy and strong. Family caregivers and elder care providers can also make a difference by encouraging the aging adult to be as healthy and strong as possible. This includes regular exercise and activity, strengthening muscles, good nutrition, and restful sleep. A healthy body is less likely to have a slip and fall accident, so when seniors stay strong it improves their balance.